The Lonely Planet Guide describes Delhi as a place where time travel is feasible, where you can step back in time or, just as easily, step into the future. In aviation terms, the past few years have seen Delhi move forward rapidly in time, rising up the ranks of global airports. 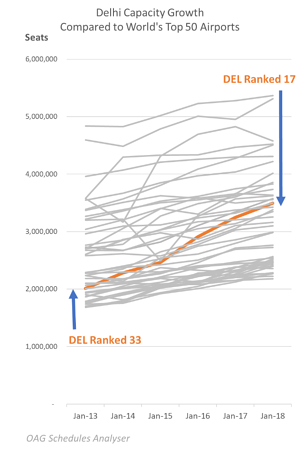 Just five years ago, Delhi was the 33rd largest airport in the world in terms of airline capacity; now it is ranked 17. We shouldn’t be surprised that this is the case when Delhi is now the second largest city in the world, with a population of 26.5 million, and second only to Tokyo. The United Nations expects the Delhi population to reach 36 million by 2030 so it’s good that air transport seems to have finally worked out how to thrive in India’s booming economy. 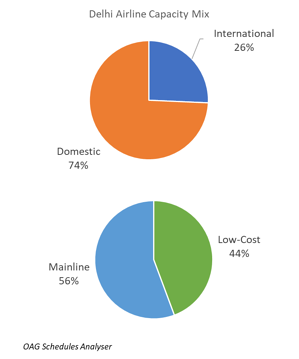 In the past year, scheduled airline capacity has grown by 9%, according to OAG Schedules Analyser, reaching just shy of 40 million departing seats. This comes on the back of 16% growth in the previous 12 months. It’s not just the domestic market which is growing but also international air services. Domestic airline capacity makes up 74% of the Delhi market and grew by 10% over the past 12 months, while international capacity grew by 8%. Low-cost carriers now provide 44% of the capacity at Delhi, having grown by 7% over the last year and by 22% in the year before that. There are 10 low-cost airlines in the market, of which IndiGo is the largest. 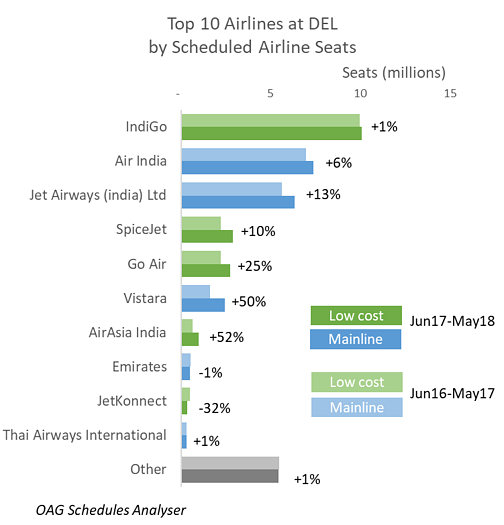 Mainline carriers are putting up a robust defence of the market, adding 12% more seats in the Delhi market over the past 12 months. Air India has grown by 6% and now operates 19% of capacity, while Jet Airways, the third largest airline at Delhi, operates 16% of capacity and has grown by 13%. Vistara, with a 6% share of capacity, grew by 50%. Delhi is home to IndiGo’s largest operation in India. It operates over a quarter of all capacity at Delhi, with a 26% share of scheduled seats. Having also added 26% more seats in the year to May 2017, the past 12 months have seen the carrier focus more on making sure the network works than on growth. As a result, IndiGo added just 1% to its seat capacity over the past 12 months. 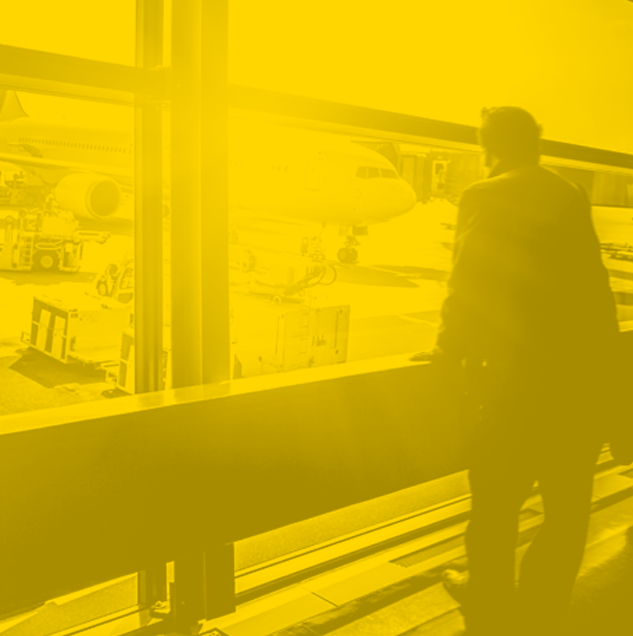 It ranks as one of the better low-cost airlines for on-time performance, placing 9th on OAG’s Punctuality League with 81% of flights recorded as on-time. So far so good, but travel forward in time a bit further and IndiGo will take delivery of some or all of the 373 A320-200 neo aircraft it has on order, as well as 26 A320-200 neos and 43 ATR 72-600 aircraft. The order dwarfs the current IndiGo fleet of 153 A320s and 7 ATRs. These aircraft will be added to IndiGo’s short-haul network, allowing the carrier to expand and add frequencies, perhaps expanding into China among other places. The recent thaw in China-India relations means we should certainly expect to see new air services, beyond the 5 Chinese airlines and 2 Indian airlines that operate between the two countries. 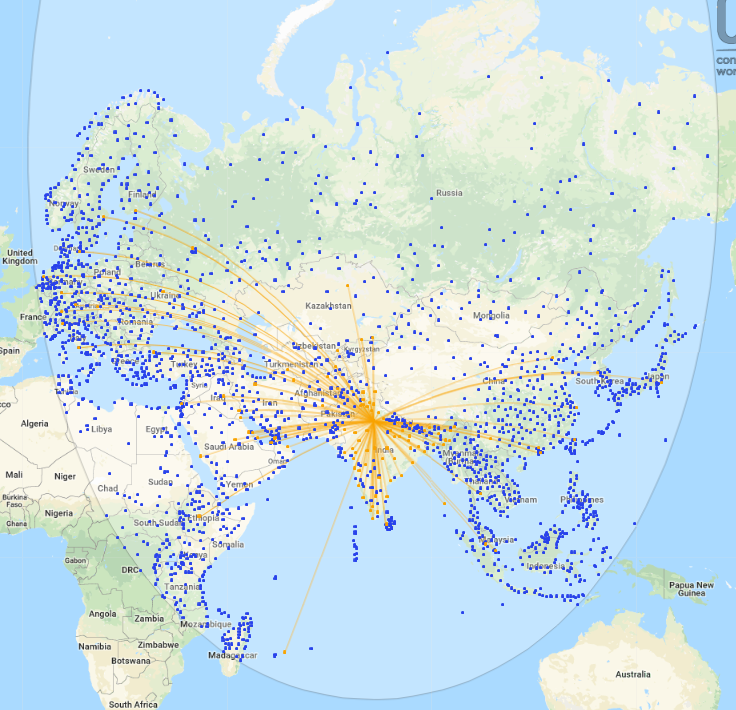 As the map from OAG Mapper shows, there are literally hundreds of yet-to-be-served destinations from Delhi for IndiGo to consider. As if this massive influx of capacity in the Indian market were not disruptive enough, IndiGo has also been looking at the Airbus SE 330 wide-body jets and may be planning to order as many as 50 of these aircraft. What sort of disruption would it cause if IndiGo were as successful in long-haul low-cost as it has been in the short-haul low-cost market? 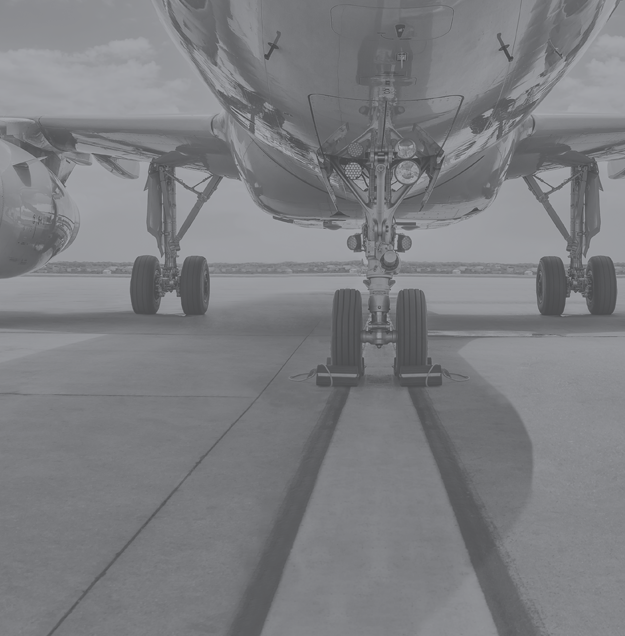 All the ingredients would be in place for a truly disruptive hub operation – the large domestic market with a growing appetite for air travel, a geography that places two-thirds of the global population within the range of the A320-200, and airlines that can provide services on a low-cost basis. 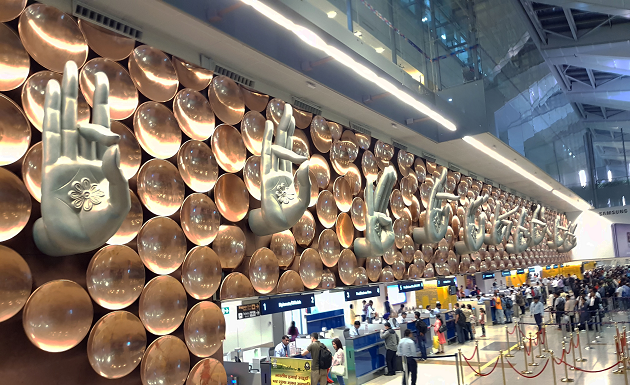 Just as Istanbul has emerged as a global connecting point for air travellers, could Delhi one day become a transfer point of choice? In March 2018 the Hindustan Times reported that transfer traffic has been growing as a proportion of total traffic, rising to 20.5% of all passengers in 2016/17, up from 9.3% in the 2010/11 period. The future may be closer than we expected. The World’s Cities in 2016, United Nations, Department of Economic and Social Affairs.